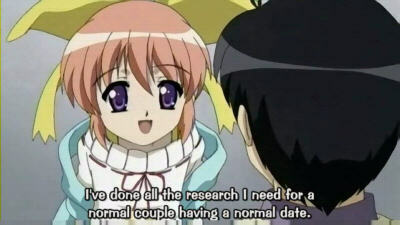 Pic of the day: "I've done all the research I need for a normal couple having a normal date". Alas, that is not enough when the characters are not normal people and neither am I.
I was certain that this year, as usual, the problem with writing 50 000 words would be my wrist (and hand, arm, and neck). But the unthinkable happened. I have entered into a staring contest with my novel. Writer's block. I blame my female main character. When in doubt, blame the women! It worked for Adam... or did it? Anyway, she is the main one carrying the book, as the main viewpoint character. And she is simply not up to the task. This could of course be because I have never been female so I don't really know what they feel. Nor have I been in love, so I guess a romance story is not the best project if I'm in a hurry. I really loved the basic idea, though. To have a man who is in love with a woman only he can see. Is he crazy? How is this different from, say, a very religious person who is absolutely convinced that he or she is never alone? Things like that. And a lot of potential for humor too, you would think. Well, scratch that.